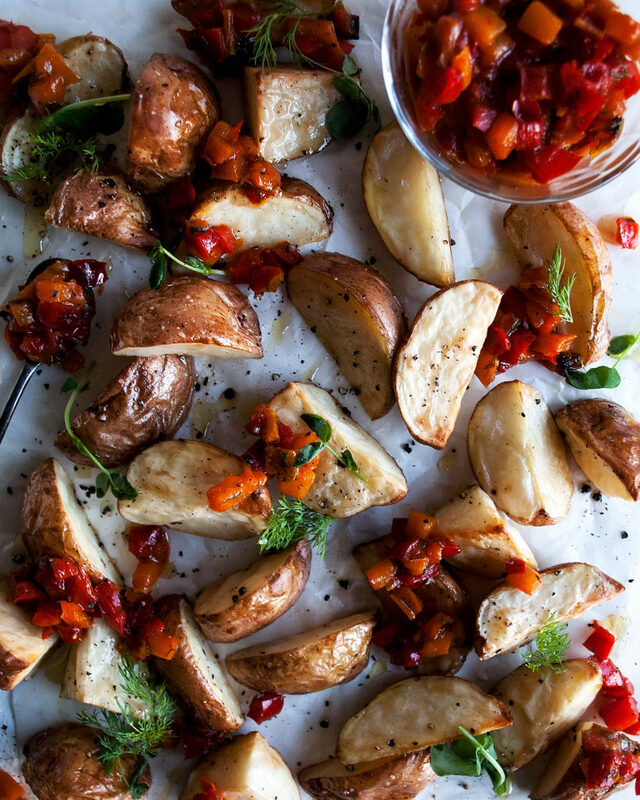 Every good steak recipe needs some potatoes to go with it, and these roasted potatoes with sweet pepper mostarda will be the perfect addition to your summertime meal. 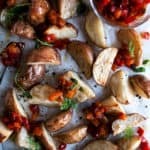 I’ve always needed lots of flavor when it comes to potatoes. I think that their starchiness is overwhelming without some acidity and brightness to cut through it. That’s why I could not be more excited to share these roasted potatoes with you. They are so simple to prepare, yet the sweet pepper mostarda adds a real punch of sweet, tangy flavor. Peppers, mustard, honey, and vinegar all cooked down into a melt-in-your-mouth condiment of sorts. 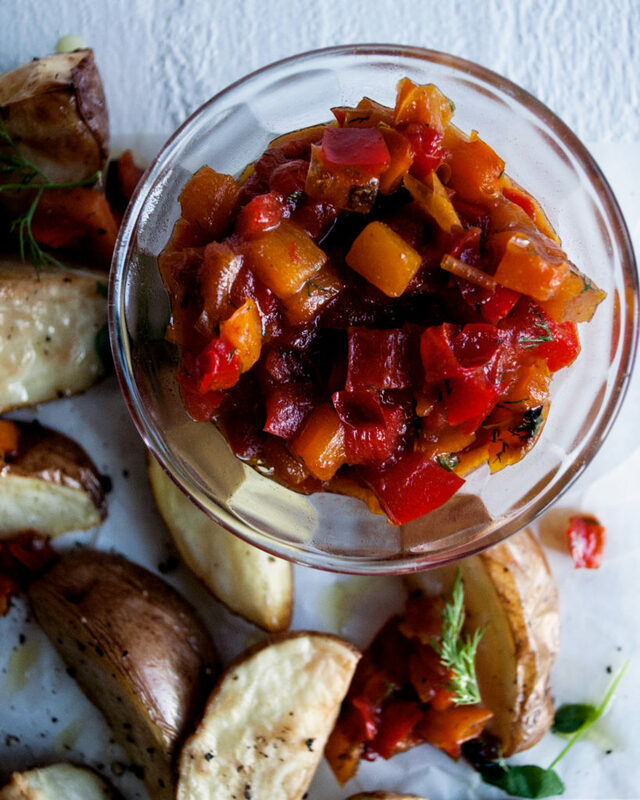 Technically, mostarda is made with fruit, but the peppers add another layer of flavor in here that works really well with the potatoes. This is the perfect side dish for the peppercorn crusted rib eyes I posted the other day. We ate them together for a recent Sunday night dinner, and the mostarda was getting spooned on top of the steaks as well. Highly recommend trying this!! Steak + potatoes = the perfect Father’s Day food. And maybe some kind of non-chocolate dessert (my dad is allergic to chocolate, which is pretty much the most unfortunate thing ever). But, I’m sure we can think of some pretty good options for him. Maybe a crème brulee, grilled pound cake with cooked fruit, or even this blueberry lavender ice cream. My trick to really crispy potatoes in the oven is a good amount of olive oil, high heat, and patience. If you give the potatoes enough time to do their thing, they will eventually crisp up. AND… lots of seasoning. Potatoes need a good amount of salt. Always. 2. Scrub the potatoes, let them dry, and cut the potatoes in quarters. If the potatoes are all different sizes, just make sure to cut them so that they are all even. 3. 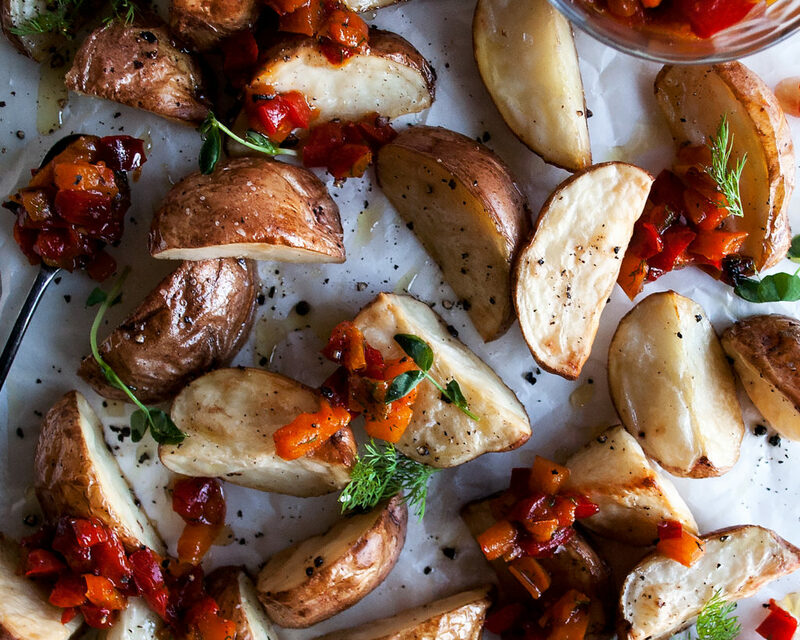 Spread the potatoes out onto a sheet pan. Coat them in a generous amount of oil and toss well. 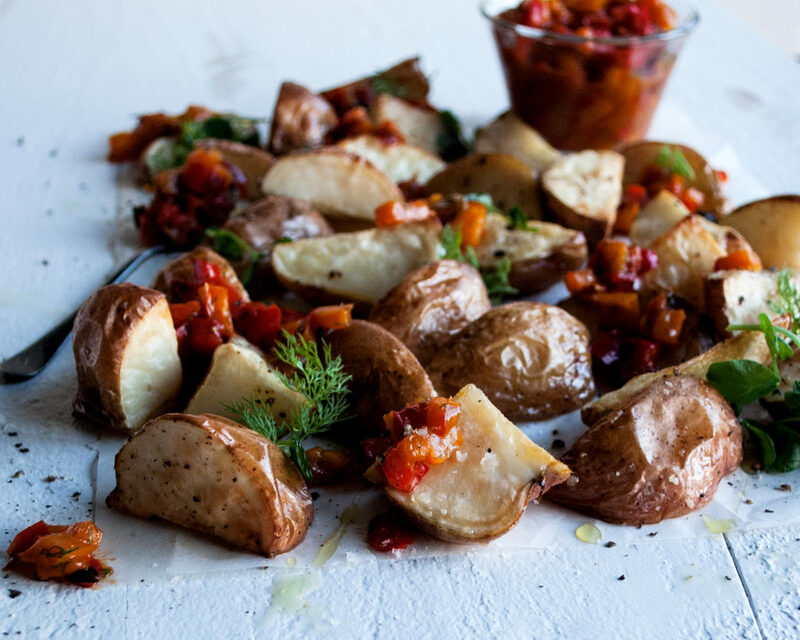 Season with a good pinch of salt and freshly cracked black pepper, distributing the seasoning evenly over the potatoes. 4. Roast the potatoes for 40-45 minutes until crispy and tender. 5. Finish with a sprinkle of flaky sea salt and a drizzle of extra-virgin olive oil before serving. 1. Heat a large saucepan over medium heat. Add enough olive oil to coat the bottom of the pan. When the oil is hot, add the diced red and yellow peppers. Season with the salt. Let the peppers sauté for about 10 minutes until slightly caramelized. 2. Stir in the champagne vinegar, honey, and dijon mustard. Let the mixture come to a bubble. Lower the heat and let cook for about 20 minutes. 3. Stir in the lemon juice and fresh dill. 4. Taste the mixture and season with more salt if needed. 5. 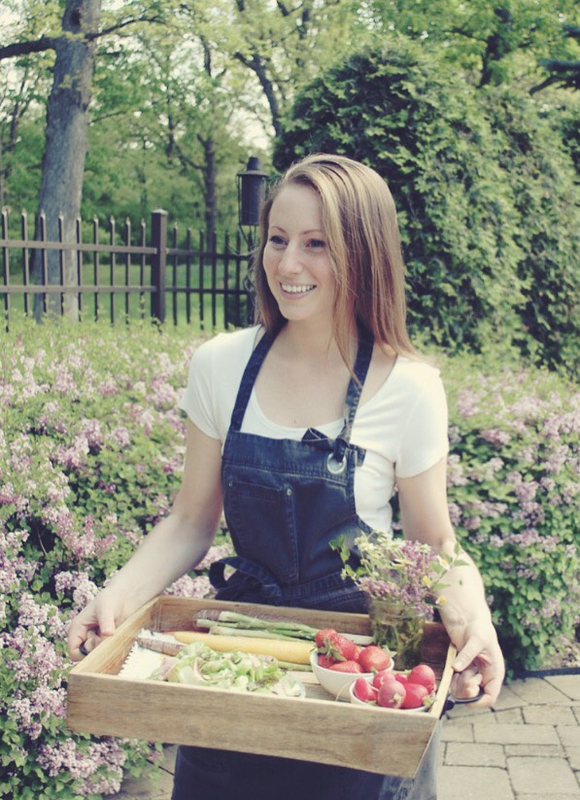 Serve alongside the roasted potatoes. I completely agree! It really is a good combination. 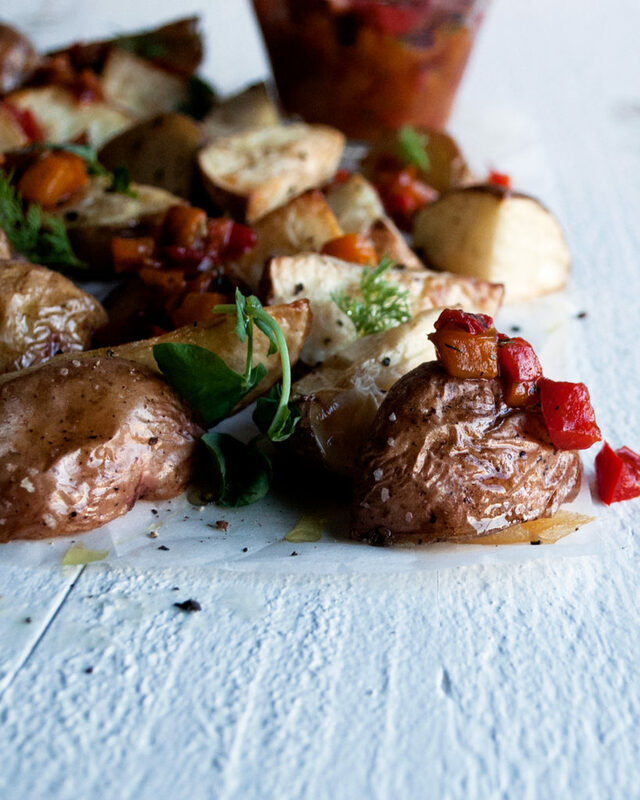 The salty, savory potatoes with a sweet, tangy topping!